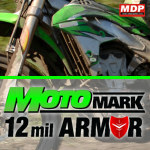 Motomark is a premium performance range has been specifically developed for decals on Motocross, ATV's, Sleds, Powersport Vehicles, Helmets and Watercraft. high bond clear adhesive on a 145 g/m2 liner. Designed for applications where a flexible premium film with special high bond adhesion is required. Can be used on low energy plastics, powder coated surfaces, aluminium and painted metals. Available in 30 inch (760mm), 54" (1370m) and 60 inch (1524mm) widths. Sold by the metre (minimum 5 metres) and by the full 45.7 metre log. 5 Year 300 micron (12 mill) flexible gloss clear PVC 300 micron armoured laminate with UV protection and clear permanent adhesive on a 86 g/m2 liner. 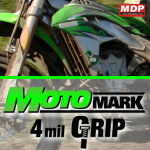 Designed as the overlaminating film for the MotoMARK 235 GRIP digital vinyl. Available in 30 inch (760mm) and 60 inch (1524mm) widths. Sold by the metre (minimum 5 metres) and by the full 22.8 metre log.